Life's Good when you're looking towards a bright future. LG has been around since 1958 when they started by out bringing affordable TVs, radios and other affordable appliances to consumers. As technology has progressed, so has LG and they have continued to work with consumer electronics and now have a rather decent wireless phone division. Each new generation of product incorporates more technology that works seamlessly in our everyday lives. From fridges to TVs, audio devices, and more, LG has been there. LG wants to create a happier and better life for people all around the world. LG hopes to become a market leader with high-quality products and brand-name recognition. I think they are well on their way to accomplishing that. Unique products and cutting edge design make the future of LG pretty interesting and hopefully we will see more creative and innovative ways to make their products better. More information about LG can be found here. 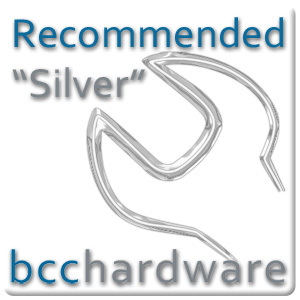 BCCHardware has reviewed a few phones in the past and we always welcome companies that want to work with us. We welcome LG to the review list and take a look at the X-Power Android phone. We're glad to take a look at this phone as it is geared for the mainstream and boasts incredible battery life. We'll touch on the major features in the next few moments. We've got a lot to cover with this device and I've only had it a couple of weeks. I've got to say that it's a pretty solid device. I've been a Nexus user for all my "smartphone" life, and as such have been an Android user since I started with the Nexus S. The LG X-Power we are looking at today is thin, but appears to be quite sturdy. I haven't tried to bend it, but neither have most iPhone 6 users and they bend easily. The X-Power seems to be quite solid even though it is a mere 7.9mm thin and it has a 5.3-inch HD screen. The battery is non-removable, but makes up for this with the 4,100 mAh rating. It is charged quickly via the Fast Charge 2.0 feature and combined with incredible battery life, this phone will spend much more time in the wild than tethered to a charger. The X-Power doesn't come with a lot of color options; in fact, it only comes in black. The side accents appear to be metal and quite shiny. LG uses gentle curves at the edges of the screen as well as for the shape of the back. The back is textured and seems easy enough to grip, although it is plastic. The textured back should take a few scrapes and scuffs without trouble. The screen is shiny and actually kicks up a bit of glare. Taking images of the device was pretty difficult when the screen was off. Either way, it feels pretty decent, but a metal back would make the phone feel a lot more sturdy and expensive. As we take a look around the X-Power K210, you'll notice that there's something on almost every side of the device. The power button is located on the right side, with the volume rocker, SIM card slot and MicroSD card slot on the left side. The SIM card slot actually holds both MicroSD and SIM cards all on the same tray. I love the ability to add extra memory to the 16GB X-Power, and the compatibility to add a 2TB memory card is absolutely awesome! Having a phone with a touch over 2TB would be amazing. LG uses a micro USB connector on the bottom of the device to charge as well as offer USB-OTG capability. Also on the bottom of the phone is the headphone jack and while some people don't like the headphones coming out the bottom, I like that both cables connect to the same end. The X-Power also has dual microphones: one top and one bottom, for better audio recording and noise cancelling during calls. The rear camera is a mainstream 8MP shooter with the front camera scaled down to 5MP. The cameras won't blow your mind when it comes to resolution, but for the price of the device, they are pretty standard. On the next page, we'll continue to cover the basic feature set of the phone before we jump into the specifications. There are a few more cool features that are worth mentioning on this Android 6.0.1 Marshmallow phone before we dive into testing. Once you power on the phone and set it up, you'll notice that you have four different lock screens to choose from. One new method is to tap the screen six times in different spots (sort of like a blind pin-pad). You also have the standard pattern unlock, PIN unlock and more. I found that tapping the screen was pretty fussy on the exact locations and it wasn't as easy as it sounded. It might be the fact that I have quite small hands and the phone has a 5.3-inch screen. LG includes a software feature that lets you scribble on your phone screen. I've used drawing apps before, but nothing as handy as this. The K210 gives you the option to draw with your fingers or stylus as well as type out notes on top of the screen. You can also make a quick memo by using the features we just mentioned. As far as the camera goes, it can be set to be voice activated and will take pictures when you say certain words. LG has a decent software suite that lets you edit pictures and videos on the fly. They even include a "selfie editor" for those of you that are obsessed with the perfect selfie. An interesting addition to the X-Power over previous phones I've used is the included section that shows recently uninstalled apps. In case you uninstall something that you want later, you will be able to find it easily. When it comes to managing your home screen, you can create folders for apps and even make the folders different colors. You can enable Google Now cards, but unless you install the Google Now Launcher, you'll have to open the Google Now app instead of just swiping to the left as you can with Nexus devices. The X-Power's Google Now is more of a widget, but it works very well. The X-Power device we received was locked to the Bell Network and they include Bell TV App which is a nice touch, but not specifically for the X-Power. Still it's a nice addition to our review sample. The settings on the phone are displayed differently and grouped by category by default. This can be changed to look more familiar if you're coming from a Nexus device. The notification tray can be pulled down to reveal more details about your notifications and access to quick settings. These quick settings are on a wide list. You can scroll left and right to access shortcuts for Wi-Fi, Bluetooth, Airplane mode, flashlight, location settings and more. You can also hide sensitive material such as text messages and notifications from other apps. Content from the notifications won't show up until you open the app. On the next page, we'll take a look at the specifications before we continue on through the review. On the next page, we'll cover device setup and jump into testing. Setup was pretty easy. I powered up the LG phone and saw the custom LG logo. After a few seconds, I was welcomed with a quick setup process. I was given the option to transfer stuff from a different device and backup this new device. This is super handy as it's hard to remember all the apps that you have installed on your other phone. Once I setup my Google account and the phone was up and running I noticed that the X-Power comes with a basic app list that includes a few from LG and Bell featured on the home screen. One of the LG apps that I found quite handy was the Quick Memo app that I mentioned before. My favorite part of reviewing products here at BCCHardware is the play time (aka. testing). I had a lot of fun with this device for a couple of weeks and wish I could have had more time, but I had to take off for a bit and drop it off about a week early. Still, I used it as my main device and put it through its paces. There are a few things that it has that my current phone doesn't and on the flip side was lacking a few features that I've come to love on my current device. While most people don't use a phone much for phone calls, it's still worth noting that calls were nice and clear and connected quickly. Voicemail is quick and simple to setup. Text messages worked without much delay. The physical buttons on the X-Power work well enough, but sometimes they seemed a bit slow to respond. Waking up the phone using the power button required a couple button presses at times. Perhaps the X-Power enters a deep sleep state which helps the battery last longer. Something that blew me away about the LG X-Power is the really amazing battery life! I had it last up to three days and I'm a pretty heavy user. I played music, some games, surfed the web, browsed social media and more and it still kept going and going. At night, I would enable battery saver and leave it on, and still it lasted for 72 hours+ of runtime. The phones large battery helps keep it going despite power hungry screen time and video recording for this review. I was very impressed. I enjoy music and love it when I can share a few songs with people that I'm chilling with. Everyone that I know enjoys good audio, but the speaker built into the LG X-Phone is not that great for sharing anything. The speaker placement is on the rear of the phone, and audio came out a bit muffled if you lay the phone on its back. In order to hear the sound more clearly, you'll have to lay the phone on the screen and risk scratching it. Obviously the headphone jack solves this problem and performs very well, but it is nice to be able to listen to audiobooks or videos and share them with your friends. If the speaker location was on the end of the device, it would be better in my opinion. On the next page we'll talk about and show some camera and video samples. The picture and video performance of the LG X-Power is pretty decent, but not outstanding. The camera application is pretty robust, but the video settings are extremely limited. We'll cover video first. When using video, the gallery and main app are shared with the camera. When the camera app is launched, you can switch to video with a simple press on the video icon on the main screen. It's close enough to the camera button that a person could easily press the wrong button and take a video instead of a picture if you're not paying attention. The idea is good, but the close proximity could be problematic. It is nice, however, that switching between the two modes is almost instant. Video playback starts immediately when you touch a video file, and while the X-Power doesn't have slow-motion capture, it does have a pretty decent video editing package. You can cut, trim, and adjust brightness in the video when editing and the microphone quality is actually really good. Adjusting brightness is a bit tricky as you have to tap the screen when playing back video, then tap again to get brightness control. Brightness control is really handy if you shot the video in dim light. However, if you don't get the tap-tap-slide ballet just right, you'll end up pausing the video. In terms of photo performance, the camera works quite well, and much like recording video, there aren't a ton of settings to adjust prior to taking a photo. After you take a picture, LG has a ton of filters that can be applied to your photos. Editing photos is very easy and there are quite a few options including white balance, color saturation, vignette or even black and white. There are a bunch of options in here. The auto fix option works really well also. I appreciate the fact that you can use the physical volume buttons to take pictures in addition to the on-screen camera button. What's more, you can even set it to voice detection and say words from a specific list and it will snap the photo automagically. You don't have to hold the phone awkwardly in order to reach a button in order to take a perfect selfie. While I don't take a bunch of pictures of myself, this option is still viable when you want to take a big group photo or a self-portrait. When it comes to obsessing about yourself, LG has a mode that lets you make the photos "softer" and this may appeal to those people who insist on posting images of themselves several times a day. The X-Power doesn't have optical image stabilization so photos in low light were a little more difficult to keep clear and crisp. It was hard to keep everything nice and still for indoor pictures without the flash. One thing that sets the X-Power apart from other Android devices I've used is the customizable home screen. We'll cover that more on the next page.